Icy Tower is a free arcade style platform game for the PC created by developer Free Lunch Design with simple, fast-paced and addictive game-play. 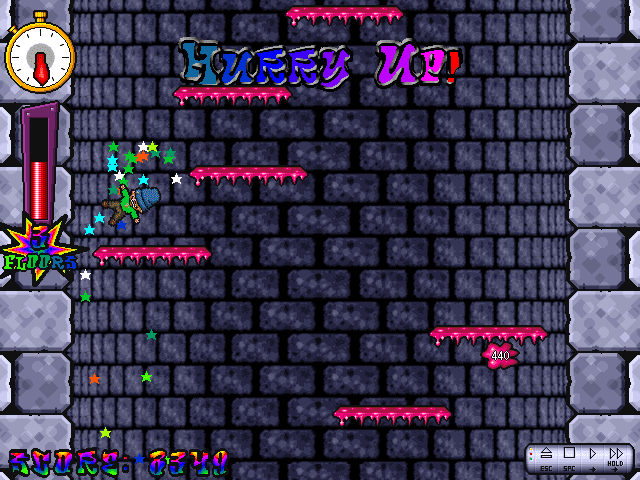 The objective of Icy Tower is quite simple, players control Harold the Homeboy as they try to climb as high up the Icy Tower as possible, jumping from one floor to the next earning points along the way. Play starts at the bottom or ground floor of a seemingly infinitely tall tower and as the players start to jump up the tower, the floors slowly start to fall away. The screen continues to scroll vertically with lower floors falling away from Harold as he jumps. The game quickly picks up speed and the higher you climb, the faster the floors fall away, forcing players to continually jump faster and faster to the next floor. With just one life per game, there's no second chance in Icy Tower, one wrong move or a missed jump and Harold will tumble to the ground ending the game. The game mechanics of Icy Tower are quite simple players use the left and right keyboard arrow keys to move Harold the Homeboy or another character horizontally across floors and then the space bar to jump. Player quickly learns that by moving left and right, Harold will quickly pick up speed, and movement combined with a jump allows Harold to bounce off the walls of the Icy Tower, flip and skip two, three or even four or more floors at one time. These moves are called combos and the more combos you can string together the greater the number of points you will earn. Icy Tower allows the player to save and share replays so it's possible to prove you actually made it to a certain floor or point total. The platform game also records three scoring categories; highest score, highest floor and the largest number of consecutive combos. Icy Tower was originally released back in 2001 and has received overwhelmingly positive reviews for its simple yet addictive gameplay. It's addictive and fast arcade game makes for a great fun over and over as players try to top their highest score. For a number of years, the PC Game site would run an Icy Tower Holiday Contest, with hundreds of replays submitted with high scores, many of which were, at the time, some of the highest scores for Icy Tower worldwide. If you enjoy mobile arcade-style games such as Flappy Bird, Timberman or Rail Rush then the Icy Tower free PC game download is something you will want to try. Icy Tower is suitable for adults and children of nearly all ages. A number of ports and sequels for Icy Tower have been made over the past few years including iOS, Android, Facebook and Mac versions of the game in addition to the original PC version that started it all. In addition to the downloadable PC and Mac versions, there is also a browser-based version of Icy Tower meaning it can also be played on a Linux or Chromebook PC. The newer mobile games have updated graphics, features and offer in-app purchases, but the Original Icy Tower PC remains completely free to download and play from various hosting sites.